Below is a game that is played by a Master and Slave team versus Bob the Violent but Honest Psychopath. The Master and Slave team starts with a certain number of Mulligans. This number is decided by Bob, with certain restrictions, as we shall see. The main part of the game consists of four rounds in which all three players simultaneously play Red or Black on each round. Unless all three players play the same colour, the Master and Slave team loses one Mulligan... or else, if they have no Mulligans left, Bob will KIIIIIIILL THEEEEEEM BAHAHAAAHAH. In addition to the four Red/Black rounds, the game has initial and final steps involving a certain Deck of cards, to be explained later. The point of these stages is that they allow us to chain strategies together to give a partial answer to the original puzzle (and also, a complete answer to "Strategy to beat the casino over the long haul"). The Master and Slave can agree upon strategies beforehand, but there is no communication allowed once the game starts, except as provided by the rules. It is for you to come up with strategies for them which guarantee their survival against Bob, who is bloodthirsty and very clever, but who will strictly follow the rules. Bob selects a card from the Deck, which he reveals to the Master. The Master then selects a card from the Deck (possibly the same card), which he reveals to Bob. He grants them two Mulligans, and tells the Slave a Small amount of information about the Master's card. Then they play four Red/Black rounds. He forfeits one of the team's Mulligans, then (correctly) guesses a Small amount of information about Bob's card. To be quite clear: step (5) consists of four rounds, in each of the which, the Master, Slave and Bob simulatneously play either Red or Black. These are their two options in each round (and is not related to the Deck in steps (1),(3),(4) and (6)). Unless all three players play the same colour, the Master and Slave team loses one Mulligan. As seen above, the Master knows in advance what Bob will play, but cannot pass this information to the Slave directly. In the first round, the Slave only knows what Bob tells him in step (4). In subsequent rounds, the Slave also knows what was played in previous rounds. In step (4), the Master also knows what Bob told the Slave. And of course, in step (6), the Slave is only allowed to choose the latter option if they have a Mulligan left. I have not yet said what the Deck is. And I have not yet said what Large and Small amounts of information mean. That is because it is up to you, dear puzzle solver! You can choose whatever Deck works for your answer. Of course, it must have the same meaning in all the steps. As I say, that is really the whole point of this, to "chain" answers to solve the original puzzle! Example: in your answer, you might specify that the Deck is the standard deck of 52 cards; "Large amount" means you know exactly which card it is; and "Small amount" means you only know which suit the card is. This is just an example, if you use it, I'm pretty sure it will get them KIIIIIIILLED. So, your task is: to come up with a (finite) Deck, and a definition for Large and Small amounts of information, and GUARANTEED (not probabilistic) survival strategies for this game. You may wish to start by dividing the possibilities for Bob's four Red/Black rounds into odd and even parity. the top four ranks from a standard deck (16 cards). These correspond to the odd parity cases (3-1 split). The colour of the card is the majority colour, and the rank of the card is the position of the minority colour. The difference between clubs and spades, and between hearts and diamonds, is irrelevant (but becomes relevant in the followup puzzle). The way I analyzed this puzzle was by looking at how many "bits" of information can be given and how many are needed. I use bit in reference to a binary digit where $n$ bits and represent $2^n$ combinations. As long as the number of bits given is greater or equal to the number of bits need then we are good. Before we start analyzing different cases we need some notation. $I_l$ represents the number of bits that comprises "a large amount of information". Similarly, $I_s$ denotes "a small amount of information". Each case will relate $I_l$ or $I_s$ to $I_l$ or $I_s$ plus additional information. For example, if Bob gives the small information and the slave chooses to give the large information then $I_s + x \geq I_l + y$ must be satisfied where $x$ and $y$ are determined by the strategy. Because of this, we can set $I_s=1$ without loss of generality. Let's start by seeing what happens when Bob chooses to give the slave the small information. As $I_s=1$, the most obvious information we can give is the majority color. If there are not two of each color, then we only use one mulligan. This lets us guess the small info which we can obtain during the one losing round (or the last round if all colors are the same). The master gave $I_s+1$ bits and the slave used $1+I_s$ bits to guess the red/black rounds and Bob's small information. This gives the following satisfied inequality $I_s+1 \geq 1+I_s$. If there are two of each color, we will use two mulligans and need to guess the large info. The master can give two extra bits in the two lost rounds and the slave only uses $I_l$ bits to guess the answer. This leads to $I_s+2 \geq I_l$ and since we know $I_s=1$ it simplifies to $3 \geq I_l$. We will want $I_l$ to be as high as possible when Bob gives us the large information, so it is likely that $I_l = 3$. Now, what happens when Bob chooses to give the slave the large information. It is impossible to give any additional information when all 4 rounds are won, so only in the cases that be identified with $I_l-I_s = 3-1 = 2$ bits (4 cases in total) can the slave guess the small information. Therefore, we are better off always using the mulligan in one of the rounds and always guessing the large information. One possibility, is to have the slave assume odd parity (a 3-1 split) and have the master give 2 bits for the minority position and 1 bit for the majority color. If the rounds have even parity, the master can choose which round to lose giving 2 bits of information and give an additional bit with what is played during the losing round. These three bits are used to guess the large information. If the rounds have odd parity, we run into a problem. We can either let the slave win all 4 rounds, but as we analyzed previously, there is not enough information to guess the small information. On the other hand, the master can intentionally fail a round giving 2 bits of information. However the failing card is forced meaning we only have 2 bits when we need 3. A 16-card deck, top four ranks of the standard deck. As I say, only rank and colour matters here, there is no difference between clubs and spades, or between hearts and diamonds. So this is effectively an 8-card deck. A Large amount of information means knowing the rank and colour of the card (effectively complete information), and a Small amount means knowing the colour of the card. first, to decide whether Bob's plays revealed in step (2) have "even or odd parity". "Odd parity" in this case means that the two colours are split 3-1. - If it is odd, then the Master plays the corresponding card: the colour of the card is the majority colour, and the rank of the card indicates the position of the minority colour. I have chosen K-Q-J-A for rounds 1-2-3-4. So for example a black queen corresponds to black-red-black-black. - If it is even (2-2 or 4-0 split), then the Master looks at the rank of the card Bob revealed in step (1), and 'flips' the play in the position corresponding to that rank to get an odd parity combination, then plays that card. The cases where there Master plays a black king follow the same pattern, but starting with red-black-black-black. Similarly for black jack and ace. This covers half the cases, and then reverse the colours to get the other half. - If Bob's plays are even, the Slave will make one mistake. The position of the mistake tells the Slave the rank of Bob's card. The colour of the Master's play in that position tells him the colour of Bob's card. Thus he has a Large amount of information about Bob's card. 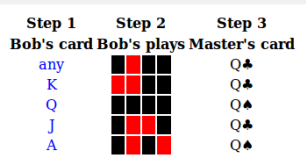 - If Bob's card is the opposite colour as the Master's, the Master intentionally makes one mistake, in the position corresponding to the rank of Bob's card. The fact the Master made a mistake tells the Slave that Bob's card is the opposite colour as the Master's, and the position tells him the rank. Thus he has a Large amount of information about Bob's card. - If Bob's card is the same colour as the Master's, the Master does not make a mistake. This tells the Slave that Bob's card is the same colour as the Master's. Thus he only has a Small amount of information about Bob's card, but they still have one Mulligan. The Slave plays that colour four times. - If Bob's plays are odd, the Slave will make one mistake. The colour of the Master's play in that position tells him the colour of Bob's card. Thus he only has a Small amount of information about Bob's card, but they still have one Mulligan. - If Bob's plays are a 2-2 split, the Slave will make two mistakes. The positions of these mistakes will tell the Slave the two possible ranks of Bob's card. The colour of the Master's play in one position tells him which of these two ranks, and the colour in the other position tells him the colour of Bob's card. Thus he has a Large amount of information about Bob's card. - If Bob's plays are all the same colour, the Slave will make no mistakes. As above, the Master either makes no mistakes, telling the Slave that Bob's card is one colour, or intentionally makes one mistake, telling the Slave that Bob's card is the other colour, and telling him the rank. This gives the Slave a Small or Large amount of information. So they are guaranteed to survive. Bob selects an ace of hearts, which he reveals to the Master. The Master then selects an ace of hearts from the deck, which he reveals to Bob. He grants them two Mulligans, and tells the Slave that the Master's card is an ace.